As a legendary venue where the walls patina witnesses the memory of exceptional events the Theatre des Bouffes du Nord hosts actors and musicians from all over the world since its early days. Built in 1876, it re-opened in 1974 under the direction of Peter Brook and Micheline Rozan. In 2010, Olivier Mantei and Olivier Poubelle took over the management of the theatre and still carry on a tradition of a place of creation. 1876 - Designed for the Café-concert repertoire, the Bouffes du Nord Theatre, commissioned by M. Chéret to the architect Louis-Marie Emile Leménil, was built on the foundations of barracks supposedly left unfinished. The hall comprised 530 seats divided into an orchestra, box seats, and a gallery. 1876 to 1885 - About fifteen unfortunate directors succeeded each other. The theatre was situated far from the centre in la Chapelle area; in the border of the fields, it had poor transport links, was badly lit and hence not attractive for the Parisian theatre-goers. As for the local audience, they are not prepared to sit quietly at the show. At times they got so involved in the events played out on stage, that the police had to throw them out of the hall. 1885 - Abel Ballet, a theatre director who mostly toiled on in the local theatres, re-opened the Bouffes du Nord. He produced grand historical epics and melodramas in which Margot cried her heart out. Shows began at 7 in the evening and often ended after midnight. Like in Montparnasse, one brings along one’s own grub to be heated on the common stove, and enjoyed during the interval. This year Yvette Guilbert made her debut in Alexandre Dumas’ The Queen Margot. 1893 - Abel Ballet hosted Lugné-Poë who staged Ibsen’s Rosmersholm and An Enemy of the People with the actors from the Théâtre de l’Œuvre, in the set designed and painted by Edouard Vuillard. 1896 - Abel Ballet resigned from the post of the director of Bouffes du Nord Theatre. Two actors succeeded him: Emmanuel CIot and G. Dublay. 1904 - At the instigation of its directors, the hall was entirely refurbished, repainted and electrically lit. As if to give it more nobility, the name of the theatre was changed to « Théâtre Molière » and authors like Henry Kistemaeckers, Georges Darien and Gaston Leroux were called on. 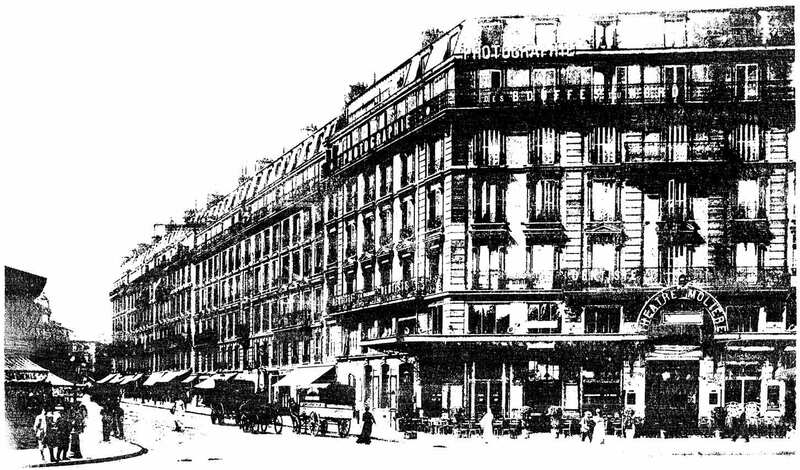 August 1914 - The Théâtre Molière, like all others, shut down. 1917 - Owners of several variety theatres, Oscar Dufrenne and Henry Varna acquired the Théâtre des Bouffes du Nord and transformed it into a music-hall. 1929 to 1935 - Paul Le Danois and Charles Malincourt took over as directors after Henry Darcet was appointed at La Scala. They pursed the policy of the Consortium as best they could. After the death of Charles Malincourt and then Paul le Danois, the Bouffes du Nord only presented occasional shows. May 1945 - As if to celebrate the Armistice, Jean Serge, a young and zealous theatre director, re-opened the theatre and named it "Théâtre des Carrefours". September 1946 - Unable to meet the operating costs of the theatre, Jean Serge retired. René Marjolle, former singer at the Opéra-Comique aimed to give a lyrical scope to the Théâtre des Bouffes du Nord, but he also pulled out after a very difficult year. June 1952 - Too old, badly kept, the theatre was not up to security standards prescribed by the authorities and had to close down. September 1969 - Narcisse Zecchinel, an Italian building contractor, bought the theatre and saved it from demolition. Excerpts from The Parisian Theatres by Geneviève Latour and Florence Claval, published by the Délégation à l'Action Artistique of the city of Paris. Peter Brook and Micheline Rozan, founders of the International Center for Theatrical Creation (Centre International de Créations Théâtrales), remembered the run down building that the Théâtre des Bouffes du Nord was at the time. Thanks to financial support from the Festival d'Automne directed by Michel Guy, they had it restored with remarkable intelligence and taste. 15 October 1974 - Reopening of Théâtre des Bouffes du Nord with Timon of Athens, adapted by Jean-Claude Carrière and directed by Peter Brook. Excerpt from Points de Suspension by Peter Brook, Éditions du Seuil. Peter Brook was born in London in 1925. Throughout his career he has distinguished himself in different genres: theatre, opera, cinema and writing. He has staged many plays, mostly by Shakespeare for the Royal Shakespeare Company, such as Love Labour’s Lost (1946), Measure for Measure (1950), Titus Andronicus (1955), King Lear (1962), Marat/Sade (1964), A Midsummer Night’s Dream (1970) and Antony and Cleopatra (1978). In 1971, Peter Brook founded the International Centre for Theatrical Research (CIRT) in Paris, which, with the opening of the Bouffes du Nord became the International Centre for Theatrical Creation (CICT). His productions stand out by their iconoclastic aspects and their international stature: Timon of Athens (1974), The Iks (1975), The Bone (1979), The Mahabharata (1985), The Cherry Orchard (1989), Woza Albert! (1989), The Tempest (1990), The Man who (1993), Who’s there? (1995), Oh! Les Beaux Jours (1995), I am a Phenomenon (1998), Le Costume (1999), The Tragedy of Hamlet (2000), Far Away (2002), Krishna’s Death (2002), Your Hand in Mine (2003), Tierno Bokar (2004), The Grand Inquisitor (2005), Sizwe Banzi is dead (2006), Fragments by Samuel Beckett (2007), Eleven and Twelve after Amadou Hampaté Ba (2009) and The Suit (the English and musical version of Le Costume, 2012). He has directed several operas: La Bohème (1948), Boris Godunov (1948), Les Olympes (1949), Salomé (1949) and The Marriage of Figaro (1949) at the London Covent Garden (United Kingdom), Faust (1953), Eugene Onegin (1957) at the New York Metropolitan (United States), The Tragedy of Carmen (1981) and Impressions of Pelleas (1992) at Théâtre des Bouffes du Nord, and Don Giovanni (1998) for the Festival d'Aix-en-Provence. With Marie-Hélène Estienne and Franck Krawczyk, he produced A Magic Flute after Mozart and Schikaneder as part of the Festival d’Automne in Paris (2010), The Valley of Astonishment (2013) and Battlefield (2015), all at the Théâtre des Bouffes du Nord theatre. His major books are The Empty Space (1968), Points de Suspension (1987), Boredom is the Devil (1991), With Shakespeare (1998), To forget the Time (2003), With Grotowski (2009) and The Quality of Forgiving (2014). Peter Brook also directed films Moderato Cantabile (1959), His Majesty of the Flies (1963), Marat/Sade (1967) and The Tragedy of Hamlet (2002). As seasons go by, the audience is invited to discover various productions combining successfully music, as well as theatre and opera. All kinds of music – classical, jazz but also contemporary music – compete for the runs on the concert season. The Theatre des Bouffes du Nord produces a large part of its concerts and shows. In doing so, four new shows per season are added to the repertoire. New projects are supported by the theatre from the start and all through the creation process by new companies as well as renowned artists. This structuring mentoring is based on a collaboration and a commitment spirit preserved over the seasons and years. In addition to Parisians shows, over 250 performances productions on tour are given all over the world. Confident with its influence, the Theatre des Bouffes du Nord also claims its local presence and commits locally for the diversity of the audience and supports the access to creation for all.